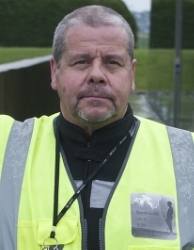 Chris Cherry has been a military historian and battlefield guide for over thirty years and a motorcyclist for fifteen. He is the author of three Amazon bestselling novels set during the world wars, that raise money for the Royal British Legion. His areas of expertise range from the outbreak of the Great War and the early engagements in Belgium and France, to the Battles on the Somme in 1916 and the fighting in Belgium around the Ypres salient. His other interests include the outbreak of the Second World War, the Battle of Britain and Operation Overlord. As well as his historical background, he is also a teacher and broadcaster, passionate about motorcycling. Battlefields on a Bike specialise in motorcycle-led tours, which tap into Chris' passions. He is also an Advanced Motorcyclist, an Observer with the Institute of Advanced Motorcyclists, a former Blood Biker with the Blood Bikes Manchester and a member of the Royal British Legion and the Royal British Legion Rider's Branch. He is also an member and occasional writer for the Western Front Association, the Last Post Association and a Member of the Guild of Battlefield Guides. Chris can also be found flying to and from the battlefields in his own aircraft. "It is an honour and a pleasure to show you the battlefields of Europe, to commemorate the sacrifice and struggle of a generation caught up in the tragedies of the wars of the twentieth centuries, whatever nation they fought for". Paul Rogers is a keen motorcyclist and a member of the Institute of Advanced Motorists where, like Chris, he is an Observer with the Manchester 500 group. Additionally he is also a blood biker for Blood Bikes Manchester. His personal interest in this period of history was stimulated by his grand-father who served with a Pals' Regiment - The Manchesters, and was lucky to have survived having been wounded on two occasions. Some years ago whilst working in the old USSR he found two books in the hotel, one concerning WW1 and the other covering the Russian Revolution. "As you can imagine, three weeks working in Moscow and St Petersburg at the Soviet Press Agency during communist times, entertainment was a little lacking. Reading both of these books whetted my appetite for a period of history that has, undoubtedly, shaped the world in which we live. To many people, like myself, this period of history is touchable as our relatives were involved in the two World Wars”. Eugenie has a life long passionate interest in both World Wars, her father having been a decorated spitfire pilot and her granddad, an Old Contemptible of the Rifle Brigade who served with distinction in the 1st World War. Her two great uncles were lost in the Great War and she knows the importance of remembrance and respect. She has been a motorcyclist for 25 years and has just retired from the Police after 33 years total service. She is an Advanced Class One certificate holder for both Police motorcyclist and car and also has certificates for these qualifications with The Institute of Advanced Motorists. 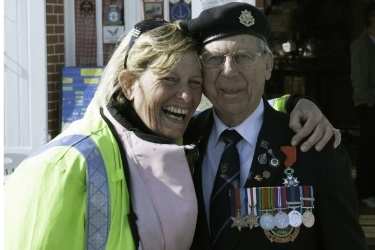 She is a member of both the Royal British Legion and the Guild of Battlefield Guides. Before her career in the Police Force she worked at the HQ of the Commonwealth War Graves Commission and so is familiar with their work and expertise. “I love going to the battlefields and to be able to tell others of the great stories of those men and women who gave up so much for us is my passion. In that way they are not forgotten and live again in our memories”.